One of the ancient technologies that is often overlooked is the creation of musical instruments. The purpose, development and in some cases the techniques used to develop music remains a mystery. Pythagoras was one of the first people to do a scientific study on the tones that seem to occur naturally in the world. And yet the use of the five tones of the pentatonic scale predates Pythagoras by millennia. High in the mountains around southwestern Germany, in an area known as Swabia, bone flutes were found in 2008 that have scientists rethinking when human creativity first showed up in history. Many of the bone flutes found around the world are made from the bones of birds. It may be that the hollow bones of birds is much easier to turn into a flute, or it could be that early cultures believed that the bones of the bird would impart some of the bird’s song into the flute, or perhaps a bit of both of these ideas is true. But something that is remarkable, is many of the bone flutes found throughout the world are tuned to the pentatonic scale. 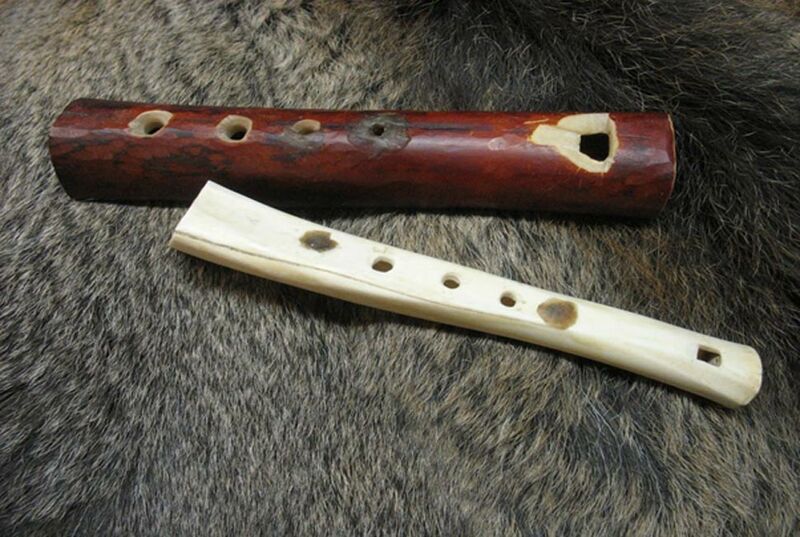 Many claim that these flutes are between 40,000 and 60,000 years old. In ancient times, the number five was considered the “number of man.” Some say this is because we have five fingers and five toes. Some say that it is because we have a head, two hands and two feet. 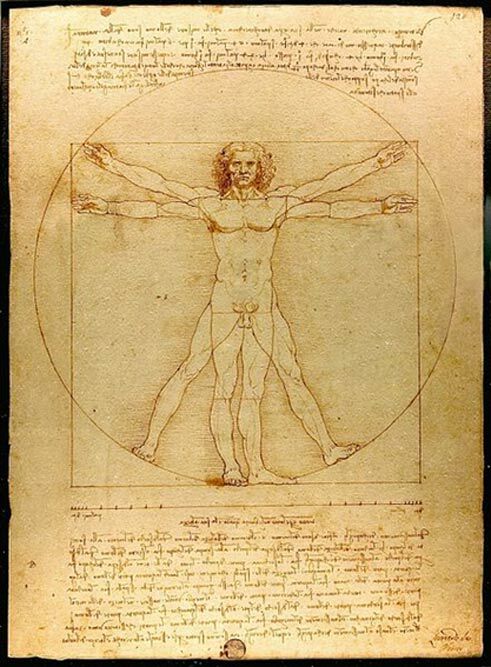 And when the man is in the position of the “Vitruvian Man,” that Leonardo da Vinci drew, we see this pentagram-ic stance making up the five pointed symbol that is still associated with the occult today. The wearing of a pentagram as jewelry may have originated with Pythagoras, and the Pythagoreans who would wear a pentacle with the Greek word for “health” “ugieia” written somewhere on the pendant. But the Pythagoreans were not the first to use the five pointed star as a symbol, as the Babylonians had been using it for centuries before Pythagoras came along. This is a theory of how intervals relate numerically, and this in turn leads one to discover proportion, symmetry and all sorts of other interesting connections, as a result of the harmony that makes up the universe itself. 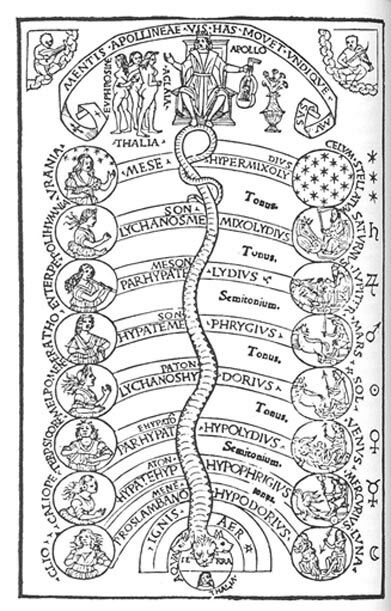 This theory was basically abandoned by the end of the Renaissance, but continues to intrigue both occultists and theologians to this day. The Pentatonic scale we now know predates Pythagoras, the Babylonians and virtually every other culture all the way back to these early bird bone flutes that have been discovered in various parts of the world. It seems to be innate to our sense of hearing that we pick up on these specific tones and are drawn to them. As a music teacher, I am constantly amazing people who previously had no musical experience, by showing them they can play music, if they use the “magic” pentatonic scale. It never ceases to impress new students who walk away with the tools needed to figure out, literally, thousands of tunes that are based off of these scales. So what is the pentatonic scale? There are actually five Pentatonic Scales. The easiest way to find the pentatonic scale is to find a piano, and begin playing the black notes. If you were to start at middle C in the center of the piano, and play each of the black notes that follow, you would play in order: D♭-E♭-G♭-A♭-B♭. If you wanted to start at a different note each time you played the scale, you would play five different scales. First by starting with D♭, then the second time through starting off on E♭, then G♭, then A♭, and then finally using the scale that starts with B♭: B♭-D♭-E♭- G♭-A♭. In conclusion, the bone flutes of the ancient cave dwellers in the Swabian Mountains stumbled upon a tuning system that has persisted down to this day, and still delights people from all backgrounds who love music. If you would like to hear a sample of how this flute sounds, you can hear one of the original members of the initial excavation team discuss both the mammoth ivory and the bird bone flutes that were discovered there. The bone flute discussed in the video is made from the radius bone of a vulture. The mouth piece functions more like blowing across a bottle, which gives it a sound very similar to blowing across a bottle. As you can see in the video, popular songs that many people will recognize are easily played on pentatonic tuned instruments. Bone flutes are not the only types of instruments that display this unique and mysterious pentatonic relationship between tones, however, there are many other instruments that I hope to share with you in future articles. Theflutemaker. "Ice Age Flute." YouTube. YouTube, 05 Aug. 2009. Web. 27 Apr. 2016. Marchofthetitans. "The World's Oldest Musical Instrument (40000, BCE) Mammoth Ivory and Bird Bone Flutes Germany." Youtube. Youtube, 9 June 2014. Web. How Music Works: Melody . By Howard Goodall. Perf. Howard Goodall. BBC, 2006. Web. Clarchaeology. "Replicating a Neanderthal Bone Flute." YouTube. YouTube, 25 Nov. 2012. Web. 27 Apr. 2016. Channel, Cctvupload. "Stone Age Bone Flute in 6500 BC." Https://www.youtube.com/watch?v=7c_dg1XSUvg. Youtube, 16 Sept. 2008. Web. 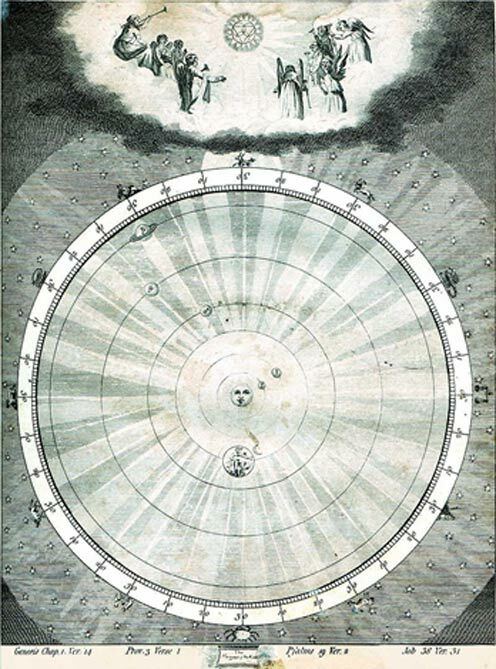 "The Pythagorean Theory of Music and Color." Http://www.sacred-texts.com/eso/sta/sta19.htm. Secret Teachings, n.d. Web. "Pythagorean Tuning." Wikipedia. Wikimedia Foundation, n.d. Web. 27 Apr. 2016. "Pythagorean Scale." Pythagorean Scale . http://www.phy.mtu.edu/~suits/pythagorean.html, n.d. Web. 27 Apr. 2016. "Pentatonic Scale." Wikipedia. Wikimedia Foundation, n.d. Web. 27 Apr. 2016.
i am looking for history of music in ancient time including musical instruments and was found here. Thank you very much. hope to see more from your hard work. Amazing I do not have musical experiance but that would be cool to learn how to do something like this. Is bird bone eisier to work also because it has less density?